Have some fun with other green and red coloured foods to add as topping! Line a dish with baking parchment. 20cm x 20cm dish. You can use a smaller or bigger one depending on how thick or thin you want your bark to be. Sit a heat proof bowl in a pan of boiling water over a medium heat. Break the chocolate into small pieces, add to the bowl and stir continuously until it has all melted. Add the vanilla and mix well. Pour the melted chocolate into the parchment lined dish. 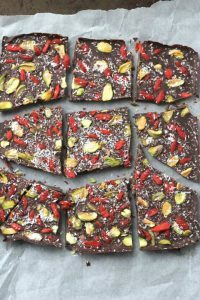 Top with the pistachios, goji berries and coconut. Place in the fridge for 30- 60 minutes or until the chocolate has set.